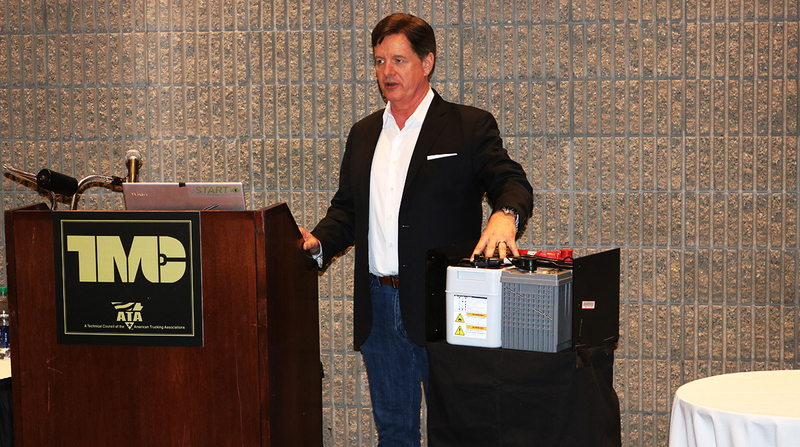 ATLANTA — Ioxus, a supplier of power management systems based on its ultracapacitor technology, has introduced wireless controls for its uStart battery support module. Technicians and drivers now can download a Bluetooth application on Android and Apple mobile devices to remotely check battery voltage and the status of the uStart system, or use its jump-start capability without needing to access the battery box. The uStart module, which replaces one or two existing batteries and installs in the same battery box, is designed to reduce battery costs and prevent costly service calls for jump-starts. The uStart system also doubles the life of the remaining battery, Colton added. Ioxus made the announcement at a March 17 press conference here at American Trucking Associations’ 2019 Technology & Maintenance Council annual meeting. The uStart system, which is available in 12-volt and 24-volt versions, is designed for Class 6 delivery trucks and Classes 7-8 day cabs and tractors equipped with up to 12-liter engines. Ioxus said the system can save $11,000 over its 15-year life through factors such as reducing battery purchases and eliminating jump-starts and battery-related roadside assistance. The product can eliminate 16 lead acid-batteries over the life of a truck in applications with a high number of starts, the company said. Ioxus, founded in 2007, is based in Oneonta, N.Y.